What will your client base look like over the next decade? Where is the gap in the market to develop a scale-able property product? The table below shows the two biggest markets predicted for the next decade will be first home buyers and down sizers. If the trend continues, more millennials will enter the work force, and immigration - where the average age of a new migrant is 29 years will continue to drive demand for new housing. Furthermore, with baby boomers leaving the work force, the demand to downsize will create new housing stock. We currently have is a problem with the ‘missing middle’. A product designed to service the customer. These multi-unit housing types typically consisted of duplexes, fourplexes, bungalow courts and mansion apartments that are not bigger than a large house. These housing types were integrated in most pre-1940s neighborhoods and often adjoining blocks with single-family homes. They provided housing diversity and generated enough density to support local commercial centers. This diversity was once a common feature in pre-war building stocks, but these housing types have become less common. The missing middle typically yields between 30 to 55 dwellings per hectare. Failing to achieve these densities in effect creates neighborhoods which are not self sustaining. What we have seen is a widening gap in-between achieving 30 dwellings and over 55 dwellings per hectare. In order to increase densities on greenfield sites in the growth corridors volume home builders are getting down to as low as 225 sq m lots. On the other side, developers are looking to create densities above 55 per hectare in order to make apartment yields stack up for the commensurate risk. All of this creates a missing middle where densities between 30 and 55 dwellings are un-attainable. The problem of the ‘missing middle’ can go in several directions. There are a couple of key trends occurring in the construction industry. 2. There have been a number of overseas acquisition of Australian residential construction market. The market is ripe for these new players to disrupt the industry’s inefficiency and create new housing distribution models. The supply of housing is set for a shake up, but where will it go? Demographics table by Matusik Property Insights are Housing Market Consultants. The government’s new VC143 amendment aims to clearly define the term ‘garden area’ in the planning scheme. Amendment VC110 announced in March 2017 provided us with an ambiguous definition of terms with no practice note explaining how it should implemented. Two VCAT cases gave us a clearer idea of where the tribunal position stood. In the matter of Guler v Brimbank CC VCAT answered the question regarding the use of eaves. The applicant raised the question that to comply with the garden area requirement the design would need to be uneaved. Council noted this did not reflect the detailed design of the area. The presiding member agreed and a strict definition of garden area needed to be adhered to and eaves could not be included. The consideration in Sargentson v Campaspe SC determined the use of garden areas where the is subdivision of a lot. Council’s view was that the garden area calculation of 30 per cent should be applied to the resultant lots of 506sqm and 530 sqm applying the wording as it relates to subdivision. The tribunal disagreed as the combined development and subdivision application was not creating lots of vacant land. 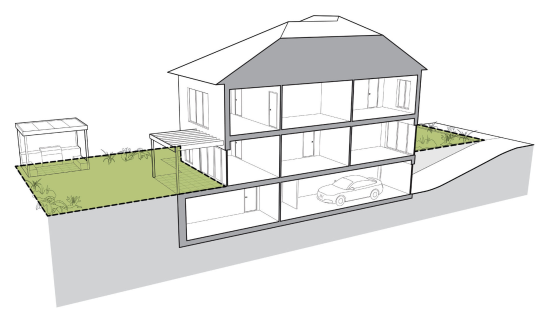 The new definition allows areas under eaves and outbuildings to be included within the garden area calculation. Furthermore where a basement does not project above ‘ground level,’ the area can be used within the garden area calculation. There has also been a change to landscaping elements. Raised deck, patio, and stepped area that do not exceed 0.8m above natural ground level are also included in the garden area calculation. We have already seen a change in council’s position on a number of projects Grayspace has been involved with. Our initial estimates have shown, we are able to get a 5% extra floor yield. Sites where the existing buildings do not comply with the minimum garden area prior to the introduction of VC110 have also been exempt. Whilst we welcome any further clarification; Guler v Brimbank CC has taught us that there are still some un-answered questions. The definition remains silent on over hanging / cantilevering elements of the building design. Nor does it address sites with swimming pools or tennis courts. The biggest change will be felt on single dwellings on a lot. The exemption from the garden area requirement will remove any controls that restrict the size of the dwelling. This applies to both inner city dwellings where lot sizes are less than 500sqm and outer suburbs where single lot developments do not require a planning permit. Where is Density in Melbourne Increasing the most? We have recently been looking at population and housing statistics looking at projected growth in relation to housing demand and supply factors. The chart below shows net annual population growth and how it is spread across Melbourne. 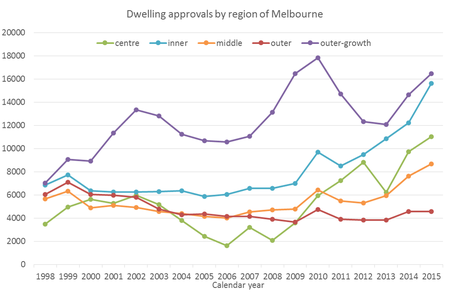 The chart below highlights a doubling of dwelling approvals across Melbourne since 2007. As can be seen there has been a surge in dwelling approval rates in inner Melbourne which almost matches dwelling approvals in the growth corridors of Melbourne. When looking at dwelling approvals figures within growth area LGAs. This seems to reverberate some of the policy positions. The 2014 Victoria in Future projections have around 45% of dwelling growth occurring in the outer growth areas between 2011 and 2031. 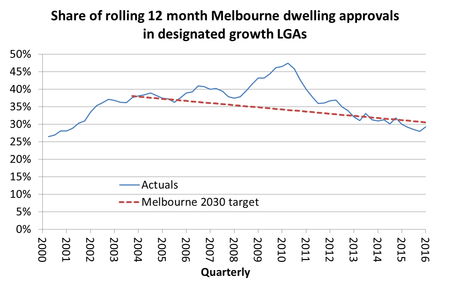 The Plan Melbourne share of dwelling growth in the outer growth areas to the year 2051 is 39%. · Dwelling approvals in “inner” Melbourne almost match the outer growth areas in number; however this is not translating to a surge in population growth in established areas; Are we building the wrong product at the wrong price point? · There has been a significant shift in the location of growth from the inner and middle ring suburbs to the outer regions; Is it easier to develop in the growth corridors?